Set in a fictional end of the 19th century England, the story revolves around a teenage boy named Allen Walker who is cursed with a cross mark on his hand that turns his arm into an enormous weapon, which he uses to hunt down and kill akumas. An akuma, generated by a 1,000-year-old phantom, is implanted into a human's soul during a moment of devastation and despair. The phantom uses the demons to then carry out his goal: destroy all humankind. I'm patiently awaiting the return of Black Butler Vol. 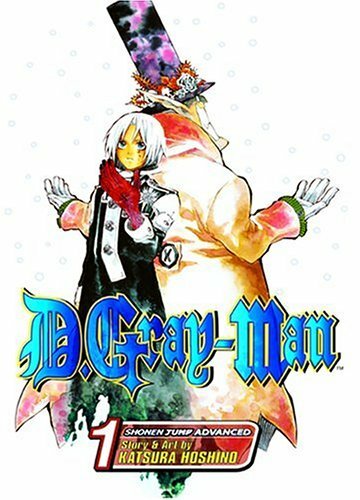 3 to the library, so until that happens, I'm taking D.Gray-Man for a spin. From what I understand, when people are super sad, this giant strange looking guy in a hat approaches them, promising the return of their loved one. Their loved one becomes this giant floating blob weapon thing that kills people with these super potent bullets. Then there's this kid with this arm that is apparently a weapon thing that can kill the giant floating blob weapons. So I'm not super technical. But I'm also not super certain I understand what is going on. I like Allen. He seems like a pretty standup kid. And the book ends with him entering some kind of headquarters and the home of like-minded individuals, so it looks like he'll soon be apart of a posse. In all likelihood, the giant strange looking guy in a hat is trying to bring about the end of the world and the posse in the headquarters are posed to stop him. I suppose we'll see what happens next. Big PRO: no one turned into the childlike version of themselves with humongous eyes. Just lo-down nitty gritty.